Have you ever wondered why you are here, why God created you the way He did, in the place you are at, among the people that surround you? Have you ever felt like you were made for something, but couldn’t put a handle on what, why, or how? Have you ever struggled with depression, doubt and self-worth? We all have and Pastor Rick Warren’s book “The Purpose Driven Life” has helped millions of people find answers to those questions with Christ-focused precision, wisdom, sensitivity, and Biblical conviction. As soon as I saw this book come up on the list of options for me to review I jumped at it. Partially because I wanted to see the updated version, but mostly because it is a perfect excuse to once again recommend and sing the praises of a book that has touched my life so deeply. I have appreciated Rick Warren’s ministry for a long time, ever since I was first introduced to him through this book 10 years ago. Though we have never met, he has blessed me personally, developed me spiritually, and equipped my ministry many times over. So yes, I’m a fan, and I couldn’t wait to get this book. It is the only book in my library of which I have extra copies to give away. I’ve read it cover to cover multiple times, taught it in small groups, and continuously pull it off the shelf to read portions of again. I can’t think of another book, outside of the Bible, that God has used to shape me more. “Aha!”, I thought, “That makes so much sense!” I remember how much this book impacted me when I was 24, and I’m glad that I have a new version of this book to pass along. The first impression I had of the new “The Purpose Driven Life: Expanded Edition” was how beautifully crafted, designed, printed and organized it is. It is a very beautiful book, just to look at. It is not only gorgeous, but savvy — this is how books should be written in the 21st century. Each day has a special QR code (specially designed pictures which a smart-phone can use to access a website) which link to short introductory videos, audio sermons (a full hour sermon for every day! ), special notes and an online support community. Check this link to Day 1 out. Originally this book had 40 days, but this new version has 42. 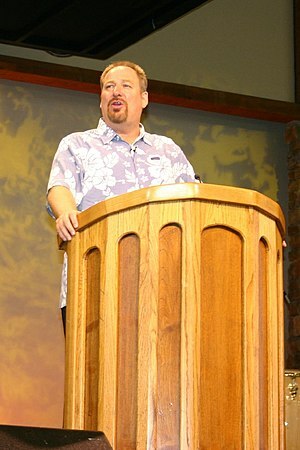 Pastor Rick has added two days [the Envy Trap (“I must be like you to be happy”) and the People-Pleaser Trap (“I must be liked by you to be happy”)] which are meant to combat what he calls “two giant problems or traps that keep most people from living the life God planned for them to live.” (quoted from the day 41 video introduction). These two chapters alone are worth the price of the book. This is still a great book, and the new additions make it even better. The one word I would use to describe this book is — “potent“. Each day is full of wisdom, biblical insight, pastoral love, practical help and critical information that will help you move closer to Jesus and bring more joy into your life. There are literally paragraphs within this book that will change your life. There are phrases within this book that you will carry with you forever. If you let it, God can use this book to help you live out His purpose for you. If you haven’t read this book, get it and read it. If you’ve already read it, it’s time to read it again. This entry was posted in Book Review and tagged Book Reviews, Christianity, Purpose Driven Life, Rick Warren. I read the book entitled The Purpose Driven Life and it was interesting and full of lessons. I really learned a lot from it.